To the irreverent—and which of us will claim entire exemption from that comfortable classification?—there is something very amusing in the attitude of the orthodox criticism toward Bernard Shaw. He so obviously disregards all the canons and unities and other things which every well-bred dramatist is bound to respect that his work is really unworthy of serious criticism (orthodox). Indeed he knows no more about the dramatic art than, according to his own story in "The Man of Destiny," Napoleon at Tavazzano knew of the Art of War. But both men were successes each in his way—the latter won victories and the former gained audiences, in the very teeth of the accepted theories of war and the theatre. Shaw does not know that it is unpardonable sin to have his characters make long speeches at one another, apparently thinking that this embargo applies only to long speeches which consist mainly of bombast and rhetoric. There never was an author who showed less predilection for a specific medium by which to accomplish his results. He recognized, early in his days, many things awry in the world and he assumed the task of mundane reformation with a confident spirit. It seems such a small job at twenty to set the times aright. He began as an Essayist, but who reads essays now-a-days?—he then turned novelist with no better success, for no one would read such preposterous stuff as he chose to emit. He only succeeded in proving that absolutely rational men and women—although he has created few of the latter—can be most extremely disagreeable to our conventional way of thinking. As a last resort, he turned to the stage, not that he cared for the dramatic art, for no man seems to care less about "Art for Art's sake," being in this a perfect foil to his brilliant compatriot and contemporary, Wilde. He cast his theories in dramatic forms merely because no other course except silence or physical revolt was open to him. For a long time it seemed as if this resource too was doomed to fail him. But finally he has attained a hearing and now attempts at suppression merely serve to advertise their victim. It will repay those who seek analogies in literature to compare Shaw with Cervantes. After a life of heroic endeavor, disappointment, slavery, and poverty, the author of "Don Quixote" gave the world a serious work which caused to be laughed off the world's stage forever the final vestiges of decadent chivalry. The institution had long been outgrown, but its vernacular continued to be the speech and to express the thought "of the world and among the vulgar," as the quaint, old novelist puts it, just as to-day the novel intended for the consumption of the unenlightened must deal with peers and millionaires and be dressed in stilted language. Marvellously he succeeded, but in a way he least intended. We have not yet, after so many years, determined whether it is a work to laugh or cry over. "It is our joyfullest modern book," says Carlyle, while Landor thinks that "readers who see nothing more than a burlesque in 'Don Quixote' have but shallow appreciation of the work." Shaw in like manner comes upon the scene when many of our social usages are outworn. He sees the fact, announces it, and we burst into guffaws. The continuous laughter which greets Shaw's plays arises from a real contrast in the point of view of the dramatist and his audiences. When Pinero or Jones describes a whimsical situation we never doubt for a moment that the author's point of view is our own and that the abnormal predicament of his characters appeals to him in the same light as to his audience. With Shaw this sense of community of feeling is wholly lacking. He describes things as he sees them, and the house is in a roar. Who is right? If we were really using our own senses and not gazing through the glasses of convention and romance and make-believe, should we see things as Shaw does? Must it not cause Shaw to doubt his own or the public's sanity to hear audiences laughing boisterously over tragic situations? And yet, if they did not come to laugh, they would not come at all. Mockery is the price he must pay for a hearing. Or has he calculated to a nicety the power of reaction? Does he seek to drive us to aspiration by the portrayal of sordidness, to disinterestedness by the picture of selfishness, to illusion by disillusionment? It is impossible to believe that he is unconscious of the humor of his dramatic situations, yet he stoically gives no sign. He even dares the charge, terrible in proportion to its truth, which the most serious of us shrinks from—the lack of a sense of humor. Men would rather have their integrity impugned. 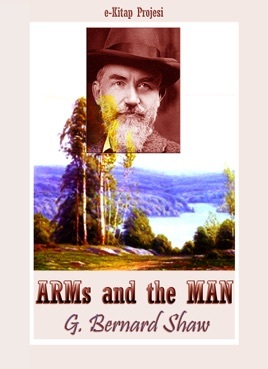 In "Arms and the Man" the subject which occupies the dramatist's attention is that survival of barbarity—militarism—which raises its horrid head from time to time to cast a doubt on the reality of our civilization. No more hoary superstition survives than that the donning of a uniform changes the nature of the wearer. This notion pervades society to such an extent that when we find some soldiers placed upon the stage acting rationally, our conventionalized senses are shocked. The only men who have no illusions about war are those who have recently been there, and, of course, Mr. Shaw, who has no illusions about anything.